J. Craig Venter Institute Creation of a bacterial cell controlled by a chemically synthesized genome. Science, Published online May 20 2010. The News told us this morning the scientists at the Venter Institute had created Life. That's a big News. J. Craig Venter, Ph.D., founder, president and chairman of the J. Craig Venter Institute (JCVI), has been named a recipient of this year’s National Medal of Science. Dr. Venter was awarded the Medal from President Obama on October 7 at a White House ceremony. Lubos say: The era of synthetic life has begun. Although Venter is technically not God, my opinion is that the future artificially created and engineered humans, if their inner working is qualitatively similar to the natural people, deserve human rights! But if they behave too badly, they have to be punished, too. Guess Lubos would be the Master then telling what is bad? Alla Katsnelson: Scientists have built a bacterial genome from scratch and used it to 'reboot' a cell from a different species of bacterium The genome of Mycoplasma mycoides consisting of about 1.1 million base pairs. 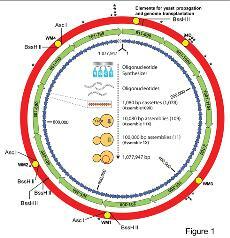 Having assembled the genome inside a yeast cell, they transplanted it into a cell from a closely related species, Mycoplasma capricolum. After the newly made cell had divided, the cells of the bacterial colony that it formed contained only proteins characteristic of M. mycoides. The cell was ready from the beginning. They did it by putting together a series of previously developed steps. What is so different from cloning? That the species is a close relative? Would it hinder the talk of immune system? Bacteria recognize foreign invaders by the lack of chemical marks called methyl groups on their DNA. The new thing is that the genome was manmade, with added methyl groups. But the instructions from a real microbe was used, so it was basically copied, just a few nonessential genes removed and a small number of sequence errors that don't affect the organism's function + four special 'watermark sequences' to distinguish it from the original. Encoded in the watermarks is a new DNA code for writing words, sentences and numbers. The two species' genomes are only about 75% identical. "It is a technical advance, not a conceptual one. Chimeric organisms have long been created through breeding and, more recently, through the transfer of native genomes into denucleated target cells" says Martin Fussenegger . We now have the ability to start with a DNA sequence and design organisms exactly like we want," says Gibson. A release was given already 13.5 by the funding organization with couplings to Exxon, Oil Palm and Jatropha. A statement to get more fundings? Synthetic cells? Not at all. How does he treat the regulation problem? The intrones that nobody yet knows how they function? Only that they increase with the phylogeneteic ladder. Maybe ancient forms of life can be created again? Multiple personal genomes await? An unprecedented ability to make many changes to a genome at once, and to add segments of DNA that aren't found in nature but might be designed to perform useful functions, he continues. Of course, the 'engineering' can be useful. Innumerous different ways can easily be thought of, as free energy, medicines for free, genetic 'chirurgy', etc. But also wast risks. The problem is basically the same as for GMO-crops. The manmade portion is not the main problem, but the dispersation of foreign genetic material in Nature. "This is the first time any synthetic DNA has been in complete control of a cell", says Gibson. A coarse overstatement. "To produce a synthetic cell, our group had to learn how to sequence, synthesize, and transplant genomes. Many hurdles had to be overcome, but we are now able to combine all of these steps to produce synthetic cells in the laboratory." The way to Lubos dream is very long. Fortunately. "He isn't God! he's actually being very human; trying to get money invested in his technology and avoid regulation that would restrict its use", Helen Wallace says. Also here. With a video. "There needs to be a lot of work in understanding how to go about designing a genetic system at the scale of the genome," Christopher Voigt says. "We don't really have a framework to think at that level." And Jim Collins: Scientists don't know enough about biology to create life. Although the Human Genome Project has expanded the parts list for cells, there is no instruction manual for putting them together to produce a living cell. The group also plans to use the approach to continue work on its project to create a 'minimal' cell that contains only the genes necessary for a cell's most basic survival. "We finally have an assay for determining the functionality of a genome," says Gibson, "So we want to try to determine the smallest number of genes needed to sustain life. This minimal cell will be a platform for analyzing the function of every essential gene in a cell. This will help us better understand how cells work." But is Life starting from a cell at all? The minimal thing is not a cell? Look at a virus. Usually viruses are not considered 'Life', but their functional aspects tell another story. It's about self-assembly. Also DNA shows self-assembly. It is not inherent in the DNA? Also tensions from outside is needed? David Deamer: "Using the tools of synthetic biology, perhaps DNA and proteins can be discarded — RNA itself can act both as a genetic molecule and as a catalyst. If a synthetic RNA can be designed to catalyse its own reproduction within an artificial membrane, we really will have created life in the laboratory, perhaps resembling the first forms of life on Earth nearly four billion years ago." "They bring to an end a debate about the nature of life that has lasted thousands of years", says Arthur Caplan. Really? May be not. Life is not that simple. 'Bottom-up' researchers, like myself, aim to assemble life — including the hardware and the program — as simply as possible, even if the result is different from what we think of as life. Constructing life using different materials and blueprints will teach us more about the nature of life than will reproducing life as we know it." Steen Rasmussen. The synthetic biology and its ethics, very good in Nature. Gibson et. al. from the Venter Institute have just published a report in Science Express (online only) that sounds very cool, but whose implications don’t seem to be well understood yet from experts in the field. Essentially the group synthesized the genome of one bacterial species and transplanted it into another bacterial species. What resulted was a new bacterial colony that only contained the proteins of the first species. We recently reported the chemical synthesis, assembly, and cloning of a bacterial genome in yeast. To produce a synthetic cell, the genome must be transferred from yeast to a receptive cytoplasm. Here we describe methods to accomplish this. We cloned a Mycoplasma mycoides genome as a yeast centromeric plasmid and then transplanted it into Mycoplasma capricolum to produce a viable M. mycoides cell. While in yeast, the genome was altered by using yeast genetic systems and then transplanted to produce a new strain of M. mycoides. These methods allow the construction of strains that could not be produced with genetic tools available for this bacterium. As a step toward propagation of synthetic genomes, we completely replaced the genome of a bacterial cell with one from another species by transplanting a whole genome as naked DNA. Intact genomic DNA from Mycoplasma mycoides large colony (LC), virtually free of protein, was transplanted into Mycoplasma capricolum cells by polyethylene glycol–mediated transformation. Cells selected for tetracycline resistance, carried by the M. mycoides LC chromosome, contain the complete donor genome and are free of detectable recipient genomic sequences. These cells that result from genome transplantation are phenotypically identical to the M. mycoides LC donor strain as judged by several criteria. I was busy posting my article and forgot to mention Mae Wan Ho's (http://www.i-sis.org.uk/circulatingNucleicAcids.php) article, Intercommunication via Circulating Nucleic Acids from last year. The genetic material isn't confined within cells, but is circulated within the body and a signal in cancers and alike diseases. Prenatal genetic material is also circulating in the mother (HLA-factors react?). The circulating genetic material is serving intercellular communication and signalling. Cellmembranes are not tight,but allow viruses and other genetic material to cross the cell membrane. Human genome is in fact mostly old viruses. Nucleic acid trafficking may be involved in intercellular signalling during development, cancer developement, in epigenetic remodelling, tissue regeneration and fine tuning of the adaptive immune system. siRNA is one type taking part in the immune system. Release of RNAi (interference) species into the circulatory system will result in systemic RNAi responses. Tunnelling nanotubes, gap junctions and other desmosomes, plasmadesmata, vesicles with miRNA is also a part of the interference pattern. Mast cells and allergic responses, secrete exosomes that contain a unique set of ~1 300 different mRNAs, far more than the geneproduct would code for. The exosomes also contain >100 different miRNAs that are promiscuous in binding and inactivating target mRNA, so the impact on gene expression in recipient cells might be quite extensive. Apoptoic processes release also DNA. Autoimmune diseases have peptides that form stable complexes with DNA. Cancer, systemic lupus erthyematosus, rheumatoid arthritis, glomerulonephritis, pancreatic, hepatitis, inflammatory bowel disease, etc are some diseases with aconnection to escaping DNA. The DNA circulating in healthy individuals simply do not have the characteristics of DNA from apoptotic or other dead cells. DNA is nevertheless actively secreted into the medium in an external equilibrium concentration. Living cells maintain a low equilibrium level of circulating DNA by secretion. In disease states, however, the rate of cell death is such that it overwhelms the capacity of the normal phagocytic cells to take up and destroy the DNA, which therefore leaks into general circulation. It has been suggested that circulating DNA takes part in homologous recombination with genomic DNA, and that this process can correct mutations as well as induce genetic changes. Some 97-98 percent of the transcripts do not code for proteins, and the job of mediating between DNA and proteins is the centre stage of molecular life. On account of widespread mechanisms such as alternative splicing, trans-splicing, and RNA editing, many RNA species cannot be easily mapped to the genome. The picture gets even more complex in disease states. Problems with prions and amyloid, also self-organizing proteins, belongs here. The cellmembrane is probably a later construction, more as a shelter than for functional reasons. The cell can survive broken cell membranes, as embryo transplantations into egg cells clearly shows. Supergenomic behavior of bacterias, and syncytias are found also today. Syncytias was the primordialLife form, and immune system developement forced the clumps to make cells? Also maybe as a shelter against sun and other electromagnetic disturbances. Variation on the order of thousands to hundreds of thousands of DNA's smallest pieces -- large swaths varying in length or location or even showing up in reverse order -- appeared 4,205 times in a comparison of DNA from just four people, according to a study published May 31 in the Proceedings of the National Academy of Sciences. Reading such small sections without seeing their place in the larger picture of DNA leaves out critical understanding. "We've integrated so many scientific problems together in a holistic way, which lets us solve very hard problems." "An enormous part of the genome is composed of repeating DNA, and important differences are often associated with areas that have a lot of repeated sections." This is a problem for codings. Take asinstance the telomere and introns,alot of repetitive sequences. What do they say? contradicts previous assumptions that epigenetic signals are generally equal across both copies of a given region of the genome, except at a small number of known imprinted genes. The epigenome sits above the DNA sequence and provides a second layer of information, regulating several genomic functions, including when and where genes are turned on or off. Allele-specific DNA methylation is a widespread phenomenon with potentially over 35,000 such sites occurring across the genome. It appears that a spectrum of skewing is likely, differing between individuals and across tissues. Because DNA methylation can also be influenced by various environmental factors, the variation we have uncovered provides a potential substrate for interactions between nature and nurture. Plant cells have highly unstable genomes. Changes in gene activity, or how genes are "expressed," help cells cope with challenging culture conditions but inadvertently also leave genes prone to mis-regulation by transposons -- bits of DNA that can jump around in the genome, inserting themselves into random genetic locations, often disrupting normal gene function and regulation. Such genomic chaos, found in cancer and other diseases, is normally prevented by a host of mechanisms that scientists call epigenetic: How transposons (sometimes called mobile genetic elements) escape these controls is one of the questions of Robert Martienssen. Inactivated by small interfering RNA (siRNA). Instead, they find that the epigenetic modifications are due to a change in the population of siRNAs produced in the continuously dividing cells. When this occurs in the vicinity of genes, this epigenetic control can have important consequences for the organism. According to Martienssen, "our work implicates RNAi in epigenetic chromatin changes that occur in immortalized cells." transposons that have lost heterochromatic marks are no longer associated with siRNA that are 24 nucleotides, or RNA "letters," in length. Rather, these re-activated transposons become associated with siRNAs that are 21nucleotides in length. In contrast, the transposons that retain their original heterochromatic marks and therefore remain silent continue to stay associated with 24-nucleotide siRNAs. So, this question is very complex.